When Nancy was invited to participate in Tourism Richmond’s Noodle-Mania event, she immediately asked if I would go in her place. There’s a good reason for that: when it comes to noodles, you might say I’m full of it. From as far back as I remember, I’ve loved noodles. It really doesn’t matter what kind: chow mein, ramen, pasta, rice noodles, I love them all. And in my travels, I’ve managed to try many different kinds, becoming a noodle know-it-all in the process. Noodle-Mania started with a limo ride from the Lansdowne station of the Canada Line on the evening of November 30, 2010. 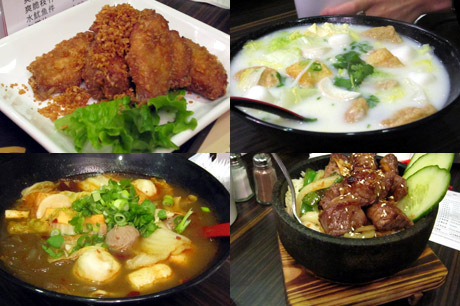 Our first stop was Spicy Stage Cafe, followed by G-Men Ramen, and ending up at Northern Dynasty in Aberdeen Centre. By the end of it, I was all noodled-out, something that hadn’t happened very often before. For the other participants, all regular food bloggers and reporters, this seemed to be a familiar setup, but it was a fun event for me to attend. Finding a kindred palate (hi, Mijune!) was the icing on the cake because now I have access to a local food reviewer whose judgment I can trust. I want to thank Tourism Richmond for putting on this event, especially for welcoming me along for the ride. Our hosts, Laura Roberts and her colleague, were very gracious. For someone like me, who seldom ventures out to Richmond to eat, it was the perfect opportunity to explore some of the fabulous restaurants in that city. Spicy Stage Cafe is a yet another Hong Kong style cafe, featuring a very wide menu of Western and Asian dishes, all modified to suit the Hong Kong palate. Their point of difference is that they have a mix-and-match noodle soup selection: pick your noodle, pick the soup, and pick the topping(s). It’s a great idea, allowing for a great deal of variety for diners. The question is how well they can pull it off. Spicy Stage Cafe put together a tasting menu for us, although we were also welcome to order other things. The menu consisted of fresh fish soup with lai fun (round rice noodles) and fish balls, house special deep fried chicken wings, cold chicken with spicy hot sauce, tom yum soup with mai fun (rice vermicelli) and prawns, Szechuan spicy soup with yam noodles and fish and beef balls, turnip cake, beef tenderloin and rice (beef bibimba), vegetarian spring rolls, and deep fried crispy tofu. I also ordered the grilled beef tongue. Overall, I found the food to be passable, but not great. MSG was noticeably present, in some cases overly so. Noodle textures were good in general, soft and slippery but not soggy. The soups were a bit disappointing. The fish soup was a bit on the bland side, with not enough salt. The Szechuan soup was the opposite: too much MSG overpowered an otherwise nicely super spicy soup. I could not try the tom yum soup due to my shrimp allergy, but I was told that it had been heavily modified for Chinese palates and missing a truly Thai flavour. The meats in general were slightly flawed: the beef balls had some gristle, the steak in the bibimba was a bit tough, chicken wings were a bit dry, and the cold chicken had no flavour other than spicy. Surprisingly, the best dish of the night was the beef tongue. It was tender, flavourful and not overcooked. I’m glad I ordered it. The bottom line: like most of these Hong Kong style cafes, the huge menu means that nothing is done particularly well. The mix-and-match noodles is a good idea, but it could use some better attention to detail. Spicy Stage Cafe is no better or worse than other cafes of this type, and I would treat it as a place I would go to for the sake of convenience, but not as a first choice. Having spent two years in Hokkaido, the northern island of Japan known for its ramen, I was especially excited to try G-Men. As you might expect, I’m extremely picky about ramen, and it takes a very good bowl of the stuff to have me singing its praises. When I found out that G-Men got its name from Gyoza King, I was a little leery of what I might find there. In Japan, restaurants typically focus on one type of food in order to get it right. You’ll find sushi bars, ramen restaurants, soba restaurants, tempura restaurants, etc. Seldom do they do more than one type of food like the Japanese restaurants here. So any time I find out about a restaurant opened by people specializing in a different type of food, I worry that it won’t be very good. Walking in, I was already pleasantly surprised. The decor was suitably rustic, with a re-creation of a traditional ramen shack in the back. It was small and cramped, and there was a bar on the outside of the shack where customers could sit and grab a quick bowl of ramen. That is the essence of ramen: it’s meant to be a balanced meal that can be quickly prepared and quickly eaten. In Japan, such ramen shacks are often located near the exits of train stations so that commuters can grab a quick dinner after a long day at work. Ironically, ramen is considered to be Chinese food in Japan; it is believed that the word “ramen” comes from the Chinese “lai mein” (pulled noodles). G-Men does Hakata ramen, a southern style of ramen from Kyushu that features tonkotsu and is very different from the miso ramen I ate in Hokkaido. Tonkotsu soup is based on boiling pork bones over high heat to bring out the flavour. Sometimes, the bones are roasted before boiling to further enhance the flavour. Unfortunately, the high temperatures can sometimes result in a slightly burnt flavour in the broth, and G-Men’s broth definitely tasted slightly burnt. The tasting menu provided to us consisted of tonkotsu shoyu ramen, tonkotsu miso ramen, chicken shio ramen, and tonkotsu ae soba. The first two featured tonkotsu flavoured with soy sauce and soybean paste, respectively. Both were very good, despite the slight burnt flavour to the soup. The noodles were definitely the star for these two dishes, having perfect texture and consistency. More important, they had the proper amount of slipperiness so they could be slurped properly. I’m not sure why, but that is one of the most difficult things to achieve with ramen noodles, and G-men nailed it. The chicken shio ramen was simple and pure, and it correctly used thinner noodles, but the soup was quite obviously a mix of their staple tonkotsu soup with chicken broth. Indeed, for some unknown reason, the burnt flavour was stronger in this soup than in the regular tonkotsu soup. Further taking away from the “chicken” label in the name is the fact that it wasn’t topped with chicken, but with pork. All in all, it was a good bowl of ramen. I just wouldn’t have called it chicken. The final dish, the tonkotsu ae soba, is like a regular tonkotsu ramen that has been drained. The noodles are cooked in the soup to infuse them with the flavour, but serving them almost dry changes the consistency and reduces the slipperiness. Still delicious, though! The other part of the ramen experience is the toppings. These were all done well by G-Men. The pork was suitably moist and fatty. (I refuse to call it cha siu because unlike real Chinese cha siu which is roasted, ramen pork is braised.) The eggs had perfect gelatinous yolks, and the wood ear fungus was crispy and chewy. I found that I actually enjoyed G-Men very much. Overall, the quality is there, and I have been told that they are consistently at that level. 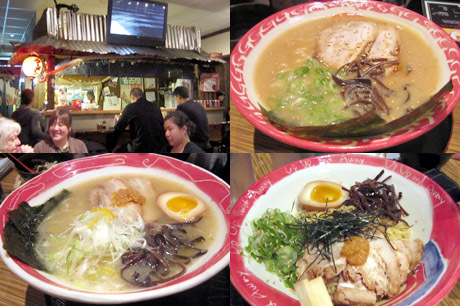 It is definitely one of the better ramen shops I’ve been to in Metro Vancouver. 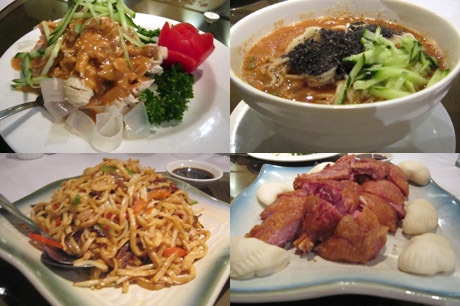 Our final stop, Northern Delicacy, is a Shanghainese restaurant located in Aberdeen Centre. The restaurant itself is beautiful, and the owners are obviously proud of the decor. Indeed, it is one of the nicest looking Chinese restaurants I’ve been to in Metro Vancouver. And unlike many opulent Chinese restaurants, there is a tastefulness to the decor that is appealing. Since Shanghai food is known for its wheat-based products, including hand-pulled noodles, it was a logical place to continue our noodle experience. The menu, of course, features much more than noodles, and we were treated to a selection of dishes. Sadly for me, they did not include any dumplings, although I did get to chat with the dumpling chef there afterward. He remembered me from the 2009 dumpling competition where he competed and I was a consultant. Our tasting menu consisted of three noodle dishes, two non-noodle dishes, and two desserts. We had shredded chicken with glass noodles, dan-dan noodles in black sesame soup, fried handmade noodles with shredded pork in fish flavoured sauce, tea leaf infused smoked duck, Beijing style chop suey with egg, lychee and gogi berry jelly, and sweet red bean paste pancakes. The glass noodle dish was like a cold chicken salad. The noodles, made from bean starch, were quite nice, but the underseasoned peanut and sesame sauce made everything taste bland and sticky. Not my favourite dish. I was unable to try the dan dan noodles because Northern Delicacy added their own twist by adding black sesame (that’s okay) and dried shrimp (that’s an allergy alert). It certainly looked and smelled good, however, and the hand-pulled noodles moved correctly. I was told that it was incredibly salty, however. The final noodle dish gave me a chance to try the handmade noodles, and I quite enjoyed chewy texture. I quite enjoyed this dish. The duck had pretty good flavour, but was so overcooked that the meat was dry and leathery. The steamed mantou buns it was served with were very good, though. The chop suey was fair, but the egg on top was overcooked. As for the desserts, the jelly is definitely for Chinese palates, only slightly sweet with subtle flavours. It was well done, but most people would find it bland. The final dish was nostalgic for me, being a family favourite when we went out to eat. I can’t help but feel that Northern Delicacy was having quality control problems that night. The selection of dishes shows that they have the aspirations to be a fine dining Shanghainese restaurant, but each dish seemed to have a flaw that spoiled their good intentions. I would like to give them the benefit of the doubt, and will reserve final judgment until I’ve had a chance to eat there again. Joseph why are you so cool?!?! Looks like we both agree on everything lol. I’m glad I found a fellow essay writer who’s honest about the food. I appreciate the details of the meal and learned even more about ramen. My favourite part of your post! Thank you! yum! sounds like I’m going to be making some noodle trips out to Richmond, along with my food court tour.